Some movies start their lives as scripts. Others as TV shows that someone, somewhere, decides to turn into film (with varying degrees of success). Not these movies though. Oh no... once upon a time, these stories only existed in book form. Now they've been adapted for the big screen, with some staying true to their source material and others using a bit of artistic licence to make the story work for cinema lovers. They've all got one thing in common though; they're all great adaptations. We've gathered up the top 30 book to movie adaptations you should definitely watch (and read). Oh, and they're also pretty good movies even without the added pedigree of their book heritage. The Book: Based on the book of the same name, Hidden Figures tells the story of Katherine Goble Johnson, Dorothy Vaughan, and Mary Jackson, NASA's black female mathematicians who were instrumental in the Space Race. Yet their involvement was largely ignored due to rampant racism and discrimination in the science industry. The Movie: Taraji P. Henson, Octavia Spencer, and Janelle Monáe star as the three 'human computers' who were kept behind closed doors because of their gender and skin colour. Just like in Margot Lee Shetterly's book, they're not content with being confined to the background. Unsurprisingly. The movie tracks their phenomenal careers despite the obstacles in their way, and that good old feel-good factor even manages to worm its way in. The Book: The memoir of Jewish pianist Wladyslaw Szpilman and his ordeal hiding out in the Warsaw Ghetto during World War Two, penned by Szpilman's friend Jerzy Waldorff. The Movie: Roman Polanski's harrowing depiction of Szpilman's experiences avoiding the concentration camps was showered with critical acclaim. In particular for the performance of leading man Adrien Brody, he won the Best Actor Oscar. The chronology of the pianist's story is re-ordered in the movie, making space for Polanski's own commentary on the period. His own experience in the Krakow Ghetto inspired the changes - including an entirely new character, Dorota. The Book: Nicholas Pileggi's non-fiction narrative explores the inner workings of the Mafia in Las Vegas, and how they lost their grip on their glittering cash cow. The Movie: The second collaboration between Pileggi and director Martin Scorsese brought Robert De Niro back into the fold, taking on the role of Jewish-American Ace Rothstein - a wiseguy planted in Vegas by the mob to oversee the day-to-day operations of their casinos. Based on a true story, the book covers the intricacies of Rothstein's literary counterpart running three casinos. Scorsese and Pileggi thought this approach would confuse audiences so they simplified it to just one; the Tangiers. The Book: Straight out of college, Charles Webb penned the novel based on his personal experience of an academic romance with an older woman. The Movie: Mike Nichol's version cast a young Dustin Hoffman in the lead as Benjamin Braddock. An impressionable youth enraptured by Anne Bancroft's older woman, their encounter is destined for the annals of film quote history by his asking: "Mrs. Robinson, are you trying to seduce me?". One of the movie's notable asides, between Benjamin and a family friend who is very interested in plastics, wasn't in the novel. The Book: The Short-Timers, an autobiographical tale of the Vietnam War written by U.S. Marine Corps veteran Gustav Hasford. The Movie: Stanley Kubrick's esoteric adaptation playfully toyed with narrative constructs - telling two separate stories of the personal strife undergone by a platoon of U.S. Marines during boot camp and beyond. Originally told in three parts, the story's final segment wasn't included and the brief boot camp chapter expanded upon. The Book: Billy Hayes' story of human endurance and survival was formed around his own incarceration and escape from a Turkish prison. The Movie: Alan Parker's adaptation brought the grimness of Hayes' experience to cinema screens, with a gut-wrenching central performance from Brad Davis as the imprisoned young American. The real-life account transcribed in the book depicts his escape as being from another prison Hayes was transferred to, and he did not kill the head guard before making his exit. The Book: William Styron's novel, about a Southern writer who befriends a couple in his New York boarding house, was so impactful on popular culture that the phrase Sophie's Choice now idiomatically refers to the task of making an impossible decision. The Movie: Sophie's Choice snagged Meryl Streep the Best Actress award for her stunning performance as a Polish immigrant in Brooklyn retelling the story of her time in Auschwitz to her neighbour Stingo (Peter MacNicol) through a series of heart-wrenching flashbacks. How Kevin Kline's larger-than-life portrayal of Sophie's lover Nathan failed to accrue any award recognition is baffling. While onboard the train to Auschwitz, the book describes Sophie's frustration at daughter Eva's sniffling nose, whining and upset due to being ill. This detail hints definitively at the reason behind her final choice - whereas in the film the scene is absent. The Book: Bret Easton Ellis' graphic psychosexual novel delves into the minutae of Manhattanite Patrick Bateman's life. It was mauled in the press for its depiction of violence. The Movie: Mary Harron directed the movie based on a script co-written with Guinevere Turner. A frank and bloody depiction of several key events in the novel, she cast Christian Bale in the role of psychotic yuppie businessman Bateman. The body count shown onscreen is considerably less than in the novel - including the painstaking details of the deaths. Bateman's first murder of the homeless man and his dog is far more brutal. 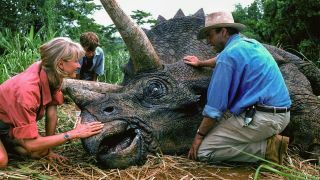 The Book: A warning to mankind of the dangers of genetic fiddling, Michael Crichton's 1990 novel captured readers with its scientific rationale for engineering real-life dinosaurs to populate a theme park. The Movie: Spielberg's adventure flick lit up the box office during the summer of 1993, plunging a bunch of scientists, lawyers, and kids into the depths of an island overrun with cloned dinos. He made Raptors a fixture in popular culture, and placed the T-Rex at the centre of one of cinema's most suspenseful sequences. Being on the edge of your seat never felt so damn enjoyable. John Hammond's grandchildren Tim and Lex were opposite ages in the novel. Lex was younger and keen on sports, whereas Tim was the older of the two fascinated with computers.